This 12 gauge 00 buck is manufactured by Sellier & Bellot in the Czech Republic. 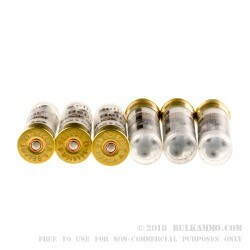 This ammo delivers 9 hard hitting 00 buck pellets and is able to reliably cycle in a wide range of shotguns. 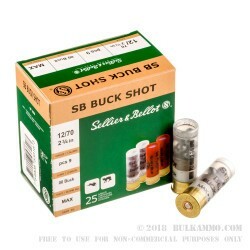 Whether you're looking for buckshot for whitetail deer or are looking for a good personal protection load this S&B ammo is a great choice for shooters looking to stock up in bulk so that you can get lots of training time in at the range. S&B is owned by CBC which also owns the Brazilian Magtech and the German MEN ammunition producers. 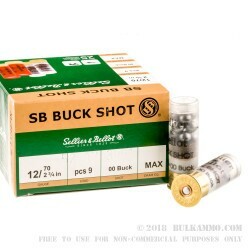 S&B has earned a great reputation by high volume shooters for reasonably priced, reliable ammunition. Ran 100 rounds thru my Mossy 500 and at 25 and 50 yds..very consistent groups as expected..... cleaned up after and appeared to be very clean powder. Q: is this lead shot or steel? A: Thank you for your question! While more and more states draft laws about ammunition components, we want to make sure our customers have the information they need to make the right choices. 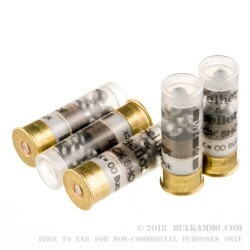 These shells are lead as Sellier & Bellot only uses lead buck shot at this time. Q: What is the average velocity of this ammo? A: Hello Douglas, Sellier and Bellot lists the muzzle velocity of this round at 1200 fps. Q: What velocity are these shells? I have a VEPR-12 and need higher velocity shells for it. A: Hello Lee, Sellier and Bellot lists the muzzle velocity of this round at 1214 fps.